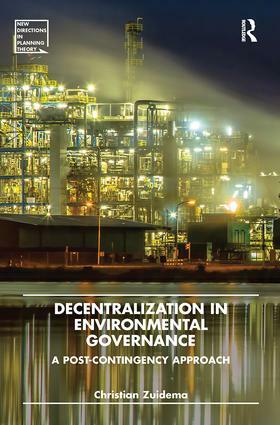 Decentralization in Environmental Governance is a critical reflection on the dangers and risks of governance renewal; warning against one-sided criticism on traditional command and control approaches to planning. The book formulates the arguments that support when and how governance renewable might be pursued, but this attempt is not just meant for practitioners and scholars interested in governance renewal. It is also useful for those interested in the challenge of navigating a plural landscape of diverse planning approaches, which are each rooted in contrasting theoretical and philosophical positions. The book develops　a strategy for making argued choices between alternative planning approaches, despite their theoretical and philosophical positions. It does so by revitalizing the idea that we can contingently relate alternative planning approaches to the circumstances encountered. It is an idea traced to contingency studies of the mid and late 20th century, reinterpreted here within a planning landscape dominated by notions of uncertainty, complexity and socially constructed knowledge. This approach, called ‘Post-contingency’, is both a theoretical investigation of arguments for navigating the theoretical plurality we face and an empirical study into renewing environmental governance. Next to its theoretical ambitions, Decentralization in Environmental Governance is practical in offering a constructive critique on current processes of governance renewal in European environmental governance.